Insured Tacoma Garage Door Technicians To Do The Job Safely! Garage doors are often the largest moveable object on a property and some components and parts are heavy duty. For example, the springs of a garage door help to lift and lower the door smoothly. Over time they can become withered and damaged just through general wear and tear. Due to the high tension often seen in the springs – they can propose danger to anyone trying to handle them. Having a trained technician inspect and deal with the problem such as those at our Tacoma Garage Door Repair service is the best option to ensure a quick fix in a safe and secure way. 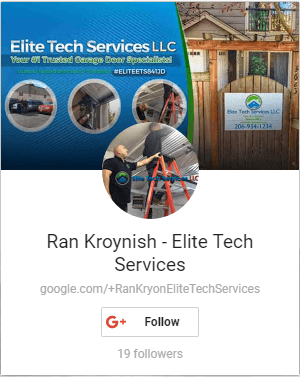 Meet The CEO • Ran K.
The Garage Door/Gate Opener Is Faulty? Simply Contact Us and we will quickly respond and arrange a consultation. Our trained service technicians will inspect the damage and provide you with a quote before commencing any work. Our technicians carry high-quality parts and know the ins and outs of all garage doors meaning quick repair. Should a more complicated issue arise, we will walk you through the process of having the garage door repaired as quick as possible. You may have noticed that the garage door on your property is not opening and closing as usual or perhaps the garage door opener has failed to respond? There are a few things you can do to establish what’s going on. Check the garage door opener is operational and check any electrical connections. Visually inspect components such as cables and springs to ensure they are all intact. Sometimes smaller parts such as rollers can become loose or the garage door can fall out of the track. Should the cables or Springs Need Replacing, the correct parts should be installed depending on the type of garage door. This will involve measuring the springs and cables to ensure it fits with the current system. Sometimes the garage door opener can be become damaged after bout of cold weather or remember to check the batteries of the door opener remote! Should you need an expert opinion and advice, contact our service: Garage Door Repair Tacoma WA. You can care and tend to your garage door on a regular basis by following some basic Maintenance advice as set out by the manufacturer of your garage door. This may often include lubricating the rollers with a silicone spray in order to lengthen the life of the components. Garage door owners can also remove debris out of the tracks in order to ensure smooth operation. All the bolts and connections should be safe and together and the garage doors position can be checked with a level. Care should be taken to not adjust parts such as torsion springs or brackets. The spring system operates the door and lifts or lowers it in a smooth motion. If it is loosened, the springs could cause serious harm to life. The springs operate at very high tensions and it is best to get in touch with your local technician who will be trained and insured in dealing with these dangerous parts. Trying to resolve a garage door repair on your property by yourself could lead to a range of problems. Ordering parts should be in line with the manufacturers recommendations as installing the incorrect part could make the problem worse! In addition, installing and replacement part from a bearing or a side plate to a spring or a panel incorrectly may cause harm and may lead to the need for Replacing The Entire Door! Our Garage Door Repair in Tacoma service is a fast repair option. We stock many parts and are often able to supply you with high quality parts that will last even longer. Garage door parts will not last forever and through general use and wear and tear they will eventually wear down and need replacing. Ignoring the problem could make the situation worse and other parts may become damaged. For example, should a cable become withered – sometimes it is necessary to replace both cables in order to ensure the even operation of the door. There is no point in having one brand new cable and an older cable operating a garage door. This may put pressure on one side of the door and lead to further complications.